Yay, you’re getting married! Oh no, there are SO many things to buy! But don’t panic. Calmly make a checklist and start shopping these incredibly—some surprisingly so—bride-centric online stores. Going for a romantic vibe at your nuptials? BHLDN has got you covered. Having a rustic-chic wedding? You’re sure to find what you need on Etsy. Keep scrolling to see the seven online stores all brides-to-be should be checking out—plus, shop our favourite items from each! J.Crew has a strong wedding section and it’s not just dresses anymore (although they definitely have those!). Shop here for everything from gorgeous hair accessories to elegantly cool thank you notes. Just the thing to have on the tables at the reception. Stone Cold Fox is a great option for the bohemian bride. Perfect for an outdoor, garden or beach wedding, Stone Cold Fox Bride’s site sells everything from floral halos to whimsical dreamcatchers. We’re getting major Kate Moss vibes from this slip dress. Cool-girl brides keep their wedding jewels simple and personal. Because flower girls can look cool too! If you’re looking for special accessories for your special day, look no further than this indie line. While Tessa Kim’s selection isn’t huge, its gorgeous assortment of veils and intimates is definitely worth checking out. This lovely tunic is also available in mint and blush, if you want something a little different. A delicate and pretty finishing touch. This is what you’ll want to be wearing for day-of wedding prep. What Kind Of Bride Are You? Take Our Quiz! We were pleased to find that Nordstrom has a strong wedding section that even includes options for the groom! We particularly loved the assortment of gorgeous I-do-appropriate designer shoes. Channeling the namesake of this veil is always a good thing. You can never guess what’s going to go wrong on your wedding, so be sure to have one of these on hand. If your dress is simple, add a little art-deco shine to it with this belt. If it’s a vintage romantic vibe that you’re going for, start with BHLDN. The price point is good and the selection is big—both major plusses. This shimmery clutch is just subtle enough. The back on this gorgeous gown is a show-stopper. Have your guests see you off with these adorable little birds. Reformation quickly became the cool-girl wedding dress destination when they debuted their bridal collection last year. If you’re looking for something unique, like a two-piece gown, look no further. You can wear this pretty dress after the wedding! Your guests will be talking about this cool two-piece long after the I do’s. This is the kind of dress that you wear, as opposed to it wearing you. Let your blushing bride beauty shine! We’ll be the first to admit that Etsy takes a little (OK, a lot of) patience, due to the amount of products. But if you take the time and know what you want, there are gems aplenty to be had! These invitations are understated, yet breathtakingly beautiful. 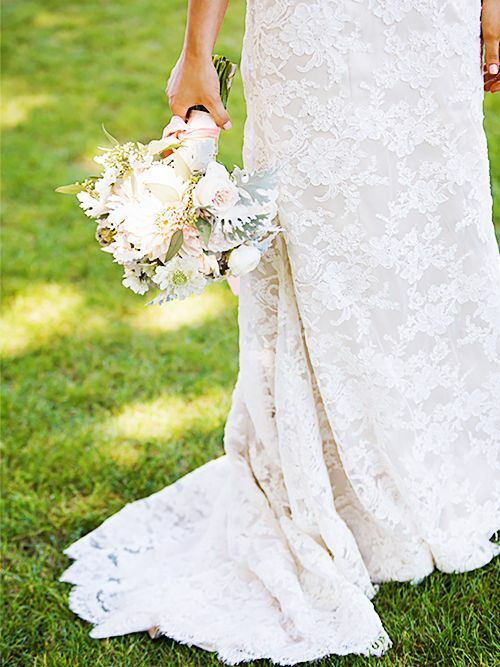 The details on this flattering made-to-order gown are so good. Add interest to a soft updo with this pretty pin. What are your favourite wedding-friendly websites? Tell us in the comments below!